Fungus gnats usually appear when you are bringing a new plant into your home. These are the most common pests you will find in new plants due to always changing humidity and high moisture. Furthermore, these pests are causing the most danger to the plant in its early stages. Hence, if they are in the larvae stage, fungus gnats will feed off the soil and they will damage the roots. Thus, it is important to identify and get rid of them quickly. Keep reading and learn how to keep your potting soil pest-free using a few natural ingredients. First off, make sure the potting soil is completely dry between waterings. If you overwater the soil constantly, fungus gnats will breed in this environment. 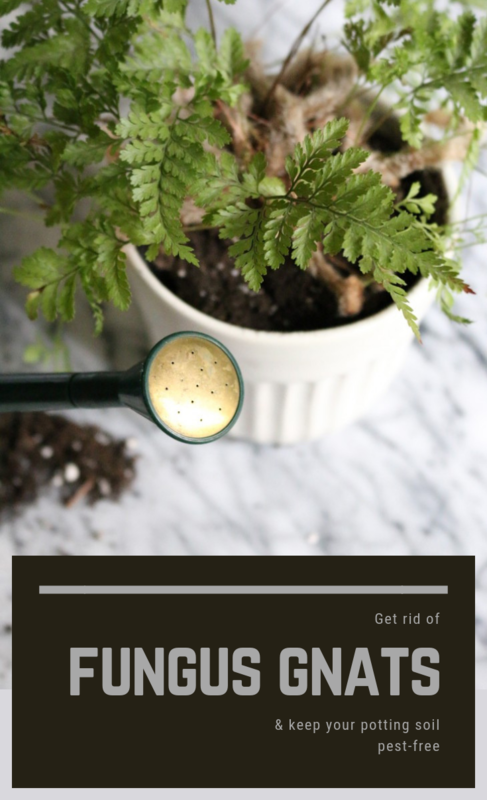 Thus, maintain the potting soil as dry as you can before watering it again so you make sure you don’t provide the condition for these pests to thrive. If you notice that your potting soil is beyond salvation, it probably is. Thus, don’t overthink it and start repotting as soon as you notice the plant. Fungus gnats will spread from one plant to another quite quickly, so take caution and act immediately. Thus, begin removing the plant from its pot. Then, using your fingers, gently remove as much soil as possible from its roots. Next, rinse the roots with clean water and start repotting the plant in a clean pot with fresh potting soil. Hence, you can use a garlic clove in the potting soil to get rid of fungus gnats and also prevent them from coming back. Simply bury a garlic clove in the soil and water as you would normally do. All you need for this is a yellow card on which you can spread a layer of honey. Then place this card on the surface of the plant soil using a toothpick. You will notice fungus gnats getting caught on the sticky card. Then, dispose of it and start again if there are still pests in the soil. Simply pour apple cider vinegar into a bowl with a wide rim. Then, cover the bowl in plastic wrap and make small holes in the top. The sweet smell of vinegar will attract the fungus gnats and the pests will find a way into the bowl without getting out.